When the first Range Rover Evoque came out in 2011, it wowed onlookers with concept car-like looks. For this new version, Land Rover saw little need to change the styling because customers have always loved it - you could argue that the Evoque was the first SUV that could be considered cool. What customers found less cool were the original Evoque’s refinement and cabin space, so plenty of emphasis has been placed on both areas when developing this new model. But buyers didn’t want it to be any bigger on the outside and, being a Land Rover, it still needed to perform off road. It also had to be more frugal, so space for mild hybrid setups was required, too. No pressure, then. As a result, the structure of this new car is almost completely new and significantly stronger than before - the only metalwork carried over is the door hinges. This stiffer structure, revised engine mounts and overhauled suspension are said to increase comfort and refinement significantly. And the good news is that it all seems to have worked. 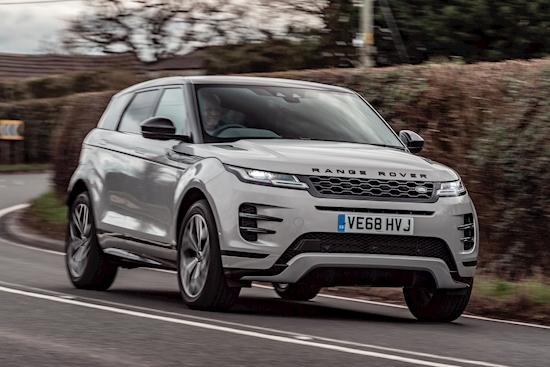 From behind the wheel, the Evoque feels very much like the baby Range Rover you’d hope it would be. The ride quality on the 20-inch wheels of our test car - wheel sizes range from 17 to 21 inches - is excellent. In comfort mode, it offers a similar floaty feeling to the air-suspended larger members of the Range Rover family. The trade off is that it isn’t as fun to drive as a BMW X1, but grip is strong and the steering precise enough. The optional adaptive dampers seem redundant though: the differences in ride and handling between comfort and sport modes are so subtle that there’s barely any point changing them. Under the bonnet, the Evoque gets the same range of ‘Ingenium’ four cylinder engines used by the last car. This time, however, all but the most basic 148bhp diesel get a 48-volt mild hybrid system. A plug-in hybrid model will join the range roughly a year from now. The most popular model is expected to be the 178bhp diesel driven here. In the last Evoque, its rather gruff nature meant it lagged behind the equivalent BMW and Audi units. It’s still gruff, but it’s now so well isolated behind soundproofing materials that it takes a keen ear to know, or care. Performance is more than adequate, it’s just a shame that the automatic gearbox doesn’t make the most of the generous torque. The software struggles to decide which of the nine speeds it wants to use, and kicks down slowly. In terms of smoothness, it sits between the clunky Audi DSG and BMW’s silky eight-speed. The Evoque remains far better at off-roading than it’ll ever need to be. Tech helps here, be it Hill Descent Control or Terrain Response 2 driving modes specific to varying loose surfaces. The new Clearsight Ground View, which lets the driver ‘see’ through the bonnet to the ground below, is not just great for off-road driving but handy when parking in tight spaces, too. But what of the mild hybrid system? Its effects are subtle: it doesn’t provide any sort of electric boost, but allows engine-off coasting below 11mph and near-instant restarts. It’s said to improve efficiency by a few mpg, though at 41.3mpg the D180 is roughly 6mpg thirstier than the X1 xDrive18d M Sport. But while the BMW has the Evoque licked for fuel consumption, it’s no match for the Range Rover inside. This is a cabin which both looks and feels far more special than those in any of its rivals: material quality and design are both wonderful. The pair of graphically sharp and fairly responsive touchscreens look great, though entrusting so many functions to them can be distracting at times. Equally pretty digital dials are standard from R-Dynamic S models upwards, but that’s not every interior screen covered yet. An optional hi-res live feed from a rear-facing camera relays an unobstructed, wide-angle view of the road behind through the rear view mirror. It takes some getting used to, though: our eyes took time to adjust to the difference in depth perception between the conventional mirrors and the screen. Despite the new Evoque being just 1mm longer than before, the wheelbase has grown by 20mm, so legroom is much better. However, taller passengers will still prefer the X1, as head and foot room are still tight. The boot, complete with 591-litre volume and wide opening, is huge, though. Prices for the new Evoque start from £31,600 when fitted with a manual gearbox and front-wheel drive (all other models get autos and four-wheel drive). At this end of the range, prices are reasonable: a £7,500 deposit gets a three-year PCP at £269 per month. However, prices start to climb very high at the top of the scale. In First Edition trim, this D180 model costs almost fifty grand. That places it into the territory of the larger, six-cylinder BMW X3. However, if you like the Evoque, you’re unlikely to care about that comparison, because only one of those cars two makes you feel truly special.